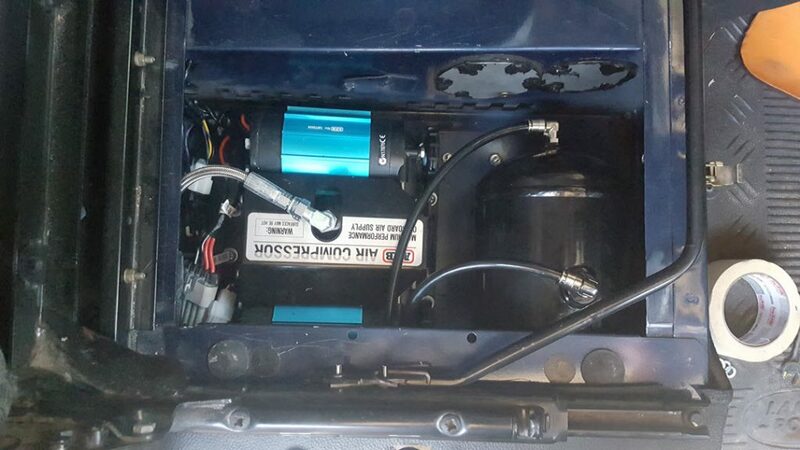 When I had my Discovery 2, I installed an ARB CLMTA Dual Cylinder air compressor. I later added a 3 litre aluminium air tank so that I could re-seat the bead on tires and run small power tools. I was so impressed with this setup that I removed it from my old car before it was sod so I could use it in the Defender. 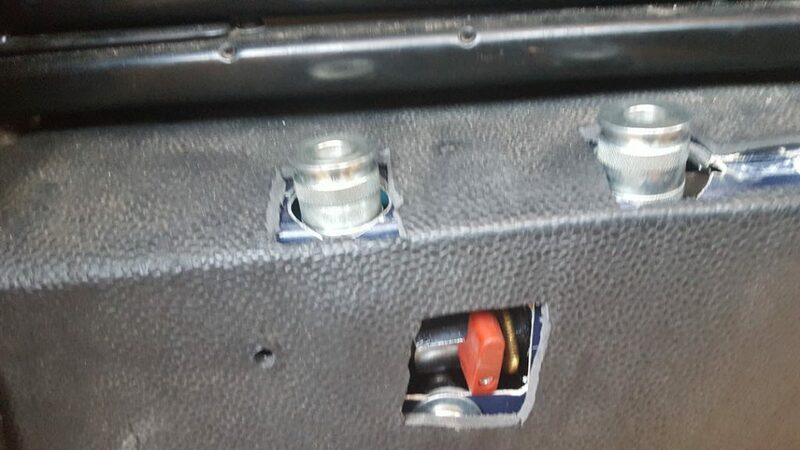 The Defender already had a compressor installed in the seat box on the drivers side when I bought it. It was an excellent place for this type of installation so I decided I would just replace the items that were already there. For the tank, I bought a 4 litre steel tank from Air-On-Board. This was a very well made product and there are lots of really good recommendations for their products al over the internet. I was very satisfied with their tank and its fixings when it arrived. I decided to add two outputs, one from the compressor and the second from the tank. This would give all the options I would ever need. T^he basic plan of my setup is shown below. If I wanted to take air direcdtly from the compressor I would plug my airline into the left output. If I wanted to run air tools, then I would open the valve and use the output on the right hand side. It was a bit of a squeeze and a little fiddly to get the compressor and tank installed under the seat. The compressor wiring and the air pipes made this a bit of a challenge. You cannot see it in the photo but under the tank is a drain valve to let all the moisture out of the tank which prevents it from rusting on the inside and becoming weak. This is how the outputs look. They pass through the top of the drivers side seat box. The valve that controls which output is used can be seen poking through the side of the seat box. The switch that turns the compressor on and off is installed in the dash. After I have finished using it, I always make sure that the tank is not left under any pressure. 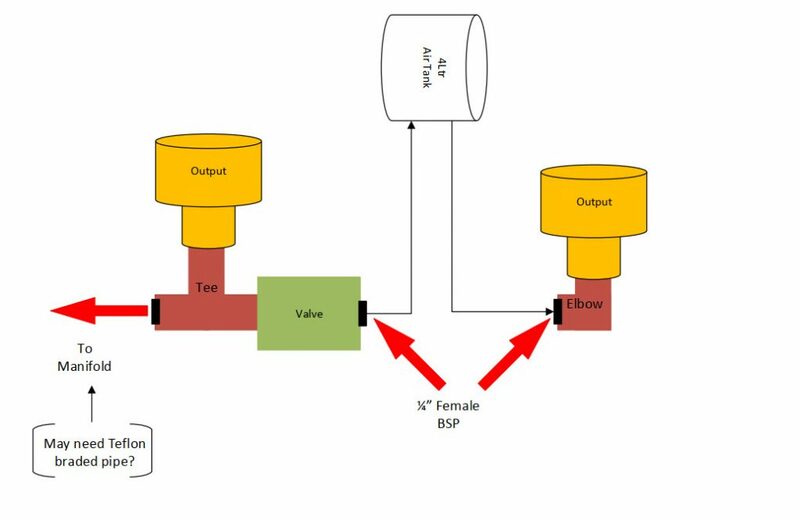 If I have used the tank, I also make sure it is drained at the next convenient opportunity. So far this setup has worked very well and I am very happy with it.It inflates my tires very quickly and allows me to use small air tools like rattle guns for my wheel nuts etc. It has also been used to re-seat a tire onto its beads and it did this without any problems at all.